I just stumbled upon this great idea: send a hug! If you are states or even miles away from your relatives, this is a great way to brighten their day! You simply have your child lay down on top of wrapping paper or other paper of your choice and trace their arms and head. 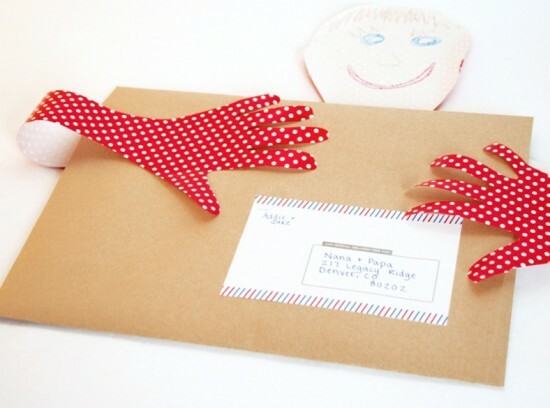 You then attach the cut out of their traced head and arms to a package or envelope that you are already sending to your relatives. Make sure to have your kiddo draw and color the head portion of the hug. This would be a great idea if you are not able to visit your mother on Mother’s Day or Valentine’s Day. There is a photo tutorial available at Super Momma Moments.